Concrete cover, in reinforced concrete, stands for the minimum distance among the surface of embedded reinforcement and the exterior surface of the concrete (ACI 130). A cover meter is used to work out the deepness of the concrete cover. 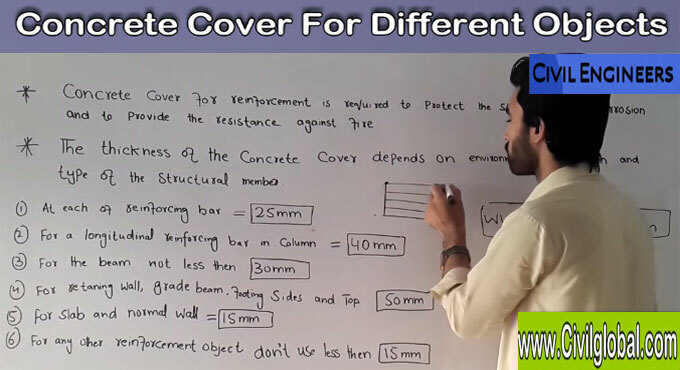 This construction video tutorial briefly describes the different dimensions of concrete covers for different bending structures. The least thickness of reinforcement cover is described in the drawings, or should be acquired from the applicable code of practice. Concrete cover for reinforcement is essential to safeguard the steel from corrosion. Besides, it has strong resistance capacity to bars implanted in concrete against fire. The density of the concrete cover is based on ecological condition and the category of the structural members. Watch the following video, to get the complete details.